Being a teacher has its advantages. One being gifts. I often get small gifts when students travel, or I get them for special occasions. I still have to reciprocate with a small gift when I go out on trips myself or during special occasions too. I tend to give small Christmas gifts, and cards, as well as other goodies for them when I do my extensive travels. While I don’t necessarily expect any gifts from students, it is always a lovely treat when they give me something. It is inevitably going to be food as it is a tradition in Japan. There is no shortage of food items to give out. This time, I got a small package of senbe (sembe for some). While I’m not a huge fan of senbe, I do enjoy it from time to time, and it is a very healthy snack. One of my students works near Tokyo Sky Tree, so it is very inevitable that when they need to get a gift for me, it is likely to be related to Tokyo Sky Tree. 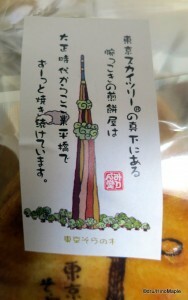 For this reason, my student got me some senbe from a small senbe shop next to Tokyo Sky Tree. At first I thought it was just a simple tourist trap, but upon researching the shop, I discovered that it was originally opened in 1923, and they are currently on their 3rd generation of chefs. It is amazing what you learn, and this shop goes to great lengths to talk about their traditions and how Tokyo Sky Tree has brought a lot of interest to their shop. Being a stalwart of Shitamachi, they are no strangers to capitalism either. 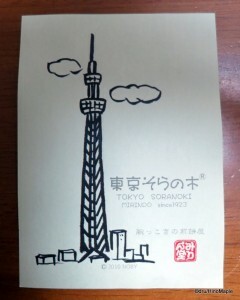 They created the Tokyo Soranoki (東京そらの木) senbe which is a very tall senbe with a print of Tokyo Sky Tree with clouds. My student bought the mini version which uses a regular sized senbe, not a long rectangular one. To be honest, the shop has caught my interest as I noticed an ice cream sandwich senbe. It looks good, and I think I’ll have to try it sometime in the summer. Who knows, maybe I’ll try it in this cold season. Either way, it seems like it would be a good post for the future if I ever do try it. The senbe itself was pretty normal. It isn’t anything to run home and cry about, but it wasn’t bad either. I have had bad senbe that was just too hard. I enjoy the softer ones and this was cooked well and to my liking. I don’t know how they get the marks with Tokyo Sky Tree, but it did look great. The soy sauce they placed on it was nice too. It wasn’t overly done and it had just the right amount of saltiness necessary to make it taste good. I do prefer a good spicy senbe, and while these were just regular senbe, I may have to venture over there to buy some of the other varieties to enjoy in the future. 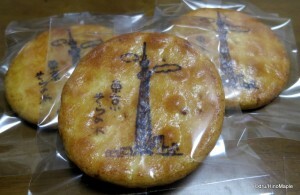 This entry was posted in Tokyo Food and tagged japan, Mirindo, rice cracker, sembe, senbe, Shitamachi, Sky Tree, Sora no Ki, Soranoki, tokyo, Tokyo Sky Tree by Dru. Bookmark the permalink. Sky Tree! 😀 I don’t care what the context is, if it’s Sky Tree, I’m happy. I bought the largest suitcase possible several years ago when I was back home. I needed something practical for when I travel back and forth. In all honesty, it is too big, but it works wonders when I go home. I often have too much stuff in my suitcase. I actually was overweight (the suitcase, and maybe a little of me too :P) last time. I think any other trip, a backpack, or at most a carry-on is okay. Omiyage always goes in both directions. However, clothes generally go in one. From home to Japan. My suitcase is the size of a coffin! 😀 It’s usually fairly empty when I go to SA, but then it gets crammed full of books and clothes and what I call “heart stuff” when I return. I think your overweight was mostly Canadian food! Oh yeah, it was a lot of food, but mostly shoes. My feet are too big for Japan. I guess. I just wish I could buy shoes here. I like a lot of them, but my feet are too big. Guess it is good in a way. I can save some money. No, but just today I was munching Oreo cookies while sitting at my computer and carefully looking at Sky Tree. Carefully, because it hurts when I turn my head (due to my current neck problems).